My grandparents, my parents and my brother and sisters and their families worked so hard to create this legacy. I am blessed to have had the experience of being part of that. Chuck Feldpausch has deep roots in our nation’s dairy community. His grandparents, Roman and Marina Feldpausch, founded their family dairy in 1945 in Saint Johns, Michigan. Chuck left home in 1993 to attend Cornell University’s animal science and dairy fellows program. That’s also where he met his wife, Nora. He returned to working with his family on the dairy in Michigan and later, he and Nora invested in a second dairy only a few miles from their homestead. In 2005, the couple adopted their son, Gilbert, and three years later had twins, Nina and Avelyn. By 2010, the family relocated to Fort Morgan, Colorado, where they could focus on building Feldpausch Holsteins, their own heifer-raising business. Soon, Chuck was traveling between Colorado and Michigan to develop the business. The birth of their fifth child, daughter Elthea, in 2011, cemented their decision to make Colorado home. Today, Feldpausch Holsteins operates as a feed yard for heifers coming from the family’s dairy in Michigan and also serves as a custom feeding operation for several other dairies, including two farms in Colorado. In July 2012, they sold their share in the Michigan dairy farm (which today is still operated by Chuck’s family) and purchased Long Meadow Farm in Greeley, Colorado, making Colorado their full-time home. 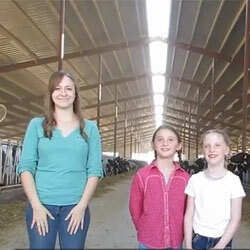 The Feldpausch children also play an active role on the dairy. “We love being able to farm as a family. Most kids never get to see what their parents do, never get to contribute. The farm gives us the opportunity to learn to work together,” said Chuck. Learn more about the Feldpausch family legacy.